Spring for marketeers means fresh flowers, and new seasons produce starts trickling through from the farms (read: mangoes!). This month, be sure to check out the new Jan Power's Farmers Markets at Albion, and also Winn Lane Spring Twilight Bazaar. The powerhouse of Brisbane markets, Jan Power, was one of the original founders of the whole market movement in Brisbane. With 5 sites now across Brisbane any given week, you'll be able to find gorgeous flowers, artisan breads, fresh meat, fish and poultry, plus stalls unique to each particular location. West End is home to the quirky and curious, which makes their markets very eclectic. Indulge in fresh fruit and veggies, fashion and gifts every Saturday. Find yourself a vintage bargain, or one-of-a-kind homemade piece of jewellery. Twice a month you can head in to the CBD to trawl through books, clothes, bric-a-brac, jewellery and records. Stall owners bring in a suitcase full to the brim with covetable trash, for you to pick up as treasure. We always find some great vintage pieces here! You would think a place of this size and quality would be for wholesale purposes only, but it is open to the public as well. There is a great range of blooms here that aren't always stocked by your local florist. The girls in house are more than happy to give you some tips for styling the perfect bunch for a special occasion. If you live near the uni campus, you must get down to the KG Markets every Saturday. There is some great, fresh produce on offer (and for much cheaper than the big chain shopping centres!). The Valley Markets fill the Brunswick Street Mall space with clothing from local designers, crates of vinyl, and hand-made jewellery. They kick off at 8am, so you could even just stay out after a big night, if you're really keen! Held at the Eagle Farm Racecourse every Sunday, these markets are likely to give you a better return than betting on a horse. With organic fruit and veg, breads, and deli delights, we would put our money on you leaving with multiple shopping bags. The markets at Moggill are a bona fide Farmer's Market. Producers and growers literally pull up in their trucks and pull trays and tubs of fresh produce out, onto a table to sell. There's also a great selection of local, free-range lamb, pork, beef and poultry. Northey Street is a farm 7 days a week, and turns into a market space every Sunday from 6:00am. Everything is organic, and everything is reasonably priced also. You must try the Banh Mi! We voted it one of the top 32 things to do in Brisbane! It's great to see Boggo Road Jail is now home to something a little less sinister: Markets! Wander through the wide array of stalls, pick yourself up a tasty little Mediterranean treat, and plant yourself in a nice shady spot. Proceed to people watch. On the first Sunday of every month, local up and coming designers show off their wares at the Young Designers Market at South Bank. It has a great array of women's fashion items, as well as accessories and kids' apparel. There is also art, homewares, and furniture. Brisbane designers are oh so talented! The only thing fresher than the Southport ocean breeze is the harvest found at Produce By The Pier. Gourmet meats, freshly grown fruit and vegetables, plus specialty wines and cheeses that make you want to throw away your wordly commitments and live on a yacht. Usually bare, the cobbled streets of Stanley Street Plaza come to life Friday to Sunday every week with the famous South Bank Lifestyle Market. These markets have the greatest variety of market stalls, from produce, baked goods, and slogan t-shirts, through to palm reading, gadgets, and art. The best markets don't make you get up at the crack of dawn. And they serve beer. The Twilight Markets in West End tick all the right boxes with live music, vintage, designer, and recycled wares, and friendly faces beaming back at you. This market is all about bringing locals together. Taking place every Sunday in Eatons Hill, these markets are a great morning out with the family, and they even do face painting for the young-uns! Get the poffertjes for brekky and the wood-fired pizza for lunch. It's great to see another night-time market pop up! Get down to Winn Lane this Friday and enjoy some fresh street food, market stalls from your favourite Valley boutiques, and live music from Brissie bands Twin Haus, and Major Leagues. We have high hopes this market becomes a regular thing. 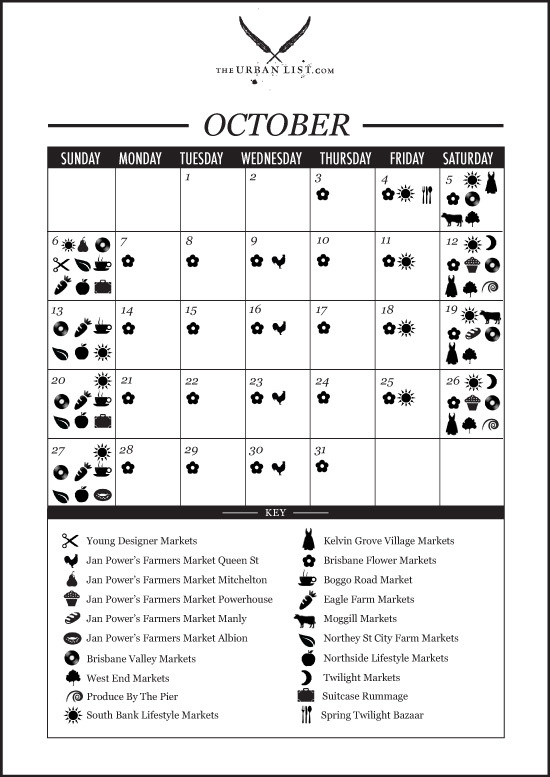 If you love our Market Calendar as much as we do, you can print it out here to put on your fridge, or get it tattooed on your thigh - PRINT ME!